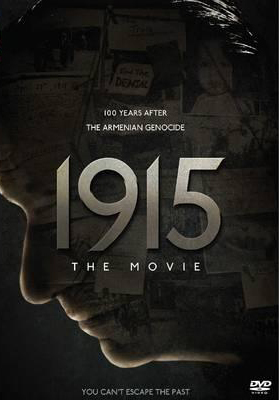 The official 1915 DVD -- including both the original English language version and Armenian language version, plus 15 special features from behind-the-scenes. NTSC format, all regions. Digital Surround 5.1. In 2015, exactly 100 years after the Armenian Genocide, a director (Simon Abkarian) is staging a play at the Los Angeles Theatre to honor the victims of that crime, forgotten and denied for an entire century. The play stars his enigmatic wife (Angela Sarafyan) as an Armenian woman in 1915 who must make a controversial decision that will alter the course of history. But this will not be an ordinary performance. As protesters surround the theater before showtime, and a series of strange accidents spreads terror among the play’s cast (Sam Page, Nikolai Kinski) and producer (Jim Piddock), it appears that Simon’s mission is far more dangerous than we think – and the ghosts of 1915 are everywhere.